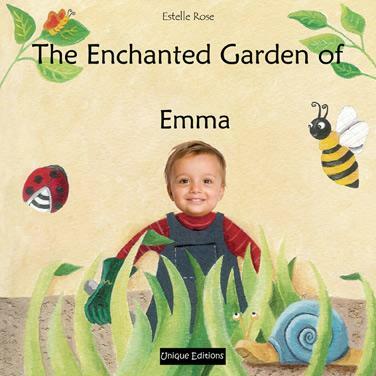 In this artistically painted collage book, your child discovers the wonders of a garden filled with flowers, unfamiliar animals and insects: rabbits, tadpoles to bright butterflies... encountering many surprises. Book description: 24 pages, size 20 cm X 20 cm, with thick high quality paper, using professional digital printing and a durable laminated cover. In this artistically painted collage book, your child discovers the wonders of a garden filled with flowers, unfamiliar animals and insects. There are hopping rabbits, swimming tadpoles and bright butterflies. Your child encounters many surprises, and often gets the chance to become a part of the circle of life in the garden. He must become a bee and pollinate flowers, fly around as a butterfly, and even grow his own plants. Enchanted Garden brings your child up close and personal with the very places he is so fascinated with at this age. Personalisation: The photo of the child appears 12 times and the name 13 times. There is also the option of a personalised message to the child that appears at the beginning of the book.